I made it up to Barr Camp again this morning. I'm currently living a 10 minute or so bike ride from Memorial Park (where the Pikes Peak Marathon and Ascent starts), so I might spend more time on the Manitou trails than I have in the past. Down in the streets of Manitou the wind was enough to knock you over, but once I climbed up into Ruxton Canyon, the world went gloriously calm and balmy. As I ran past the Cog, I said hello to Freddie or Eddie Baxter (they're twins) who was no doubt just finishing up his daily circuit of the Incline. 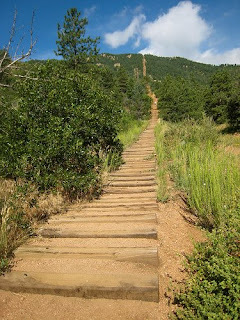 Speaking of which, hiking the Incline may very soon become legal, as a result of a little quid pro quo betwixt the Colorado Springs Utilities and the Cog Railway. Read about it here. I've never done the Incline as part of my training (maybe if I ever do Hardrock, I'll start), but I do recognize it as an incredible means of inspiring more people (all kinds of people, not just hard-core types; just check out the crowd on there some weekends) to get outside and use their bodies. I think it's that kind of activity that can hopefully help someone gain an appreciation for the land and the mountains that maybe they didn't have before. Anyways, the conditions on the trail this morning were already vastly improved from Sunday morning. It was mostly dry on the Ws with only a few patches of dirty ice, and from there to No Name the trail was virtually completely dry. Of course, above No Name, things went south quickly with the "trail" becoming a rock-hard cowpath of ridiculously uneven frozen slush and snow. Screw shoes would've been prudent. Despite this, the jaunt to Barr was idyllic with the peak itself enshrouded in a cloud of swirling snow whipped up by the hurricane-force winds up there. The run down was a nail-biting affair above No Name Creek with all of the ice, but below there the sunshine and my much improved purchase on the trail allowed my mind to wander to the lyrics of a Yeasayer song all the way back down to Manitou. "Yeah, yeah, we can all grab at the chance to be handsome farmers!!" That's often exactly the sentiment I feel when I'm running in the mountains. 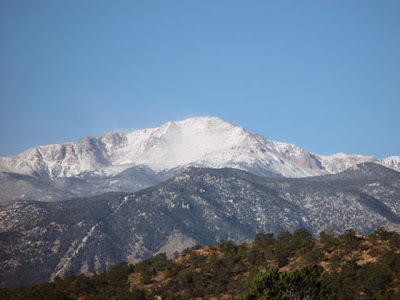 Pikes Peak, EIGHT THOUSAND feet of vertical. This past week is the first one of the year in which I have logged 100 miles or more. Of course, there's nothing magical about rolling over into the triple-digits, but it does represent, to me, a level of healthiness and consistency in my running that usually indicates I'm on my way to engaging in some significant race preparation. Additionally, since I've only been running once a day, it means that my average daily run has eclipsed (ever-so-slightly) the 2 hour mark; again, this is just another rather arbitrary quantification, but it gets me excited about the upcoming season. The past three months have been atypical for me in that I haven't launched head-long into maximal-level training at the first hint of complete health. Although I've been slightly dinged up over the past couple months, I've mostly just been--for maybe the first time ever--practicing an exceedingly gradual build-up in mileage/time in my training starting from (nearly) zero around the first of the year. Hopefully, such a prudent (rational? non-boneheaded?) approach will result in more consistent training/fitness for the year. Not surprisingly, this new level of training has conincided with my return to what I'm increasingly beginning to think of as my "home state". Although my experience growing up in Nebraska will always remain the source of my most core values and life habits (and, hopefully, a permanent place to take refuge in relative isolation), I've spent most of the last 7 1/2 years in Colorado. 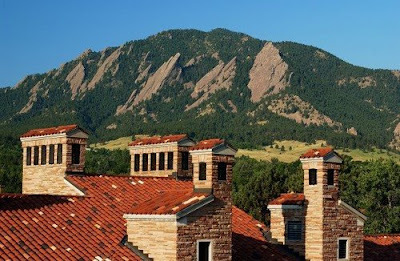 This past week I moved back to the Front Range once again for at least the next couple of years as I've accepted a place in the CU-Boulder Geography Department's Masters program, starting this Fall. I am extremely excited to begin the work of becoming a scientist once again, this time working on the acid mine contamination of the watershed at a Superfund site near Creede, CO. And clearly, living, working, and studying in Boulder will be a convenient place to continue with copious amounts of mountain running in the coming years. The CU campus with Green Mountain looming in the background. The past week has provided me with a fantastic refamiliarization with all of my beloved trails here in Colorado Springs. Yesterday I had a beautiful run with the Team CRUD folks up Crystal Park Road and down the Section 16 and Intemann trails. This run involved a 3000' climb, shindeep post-holing, downhill powder-floating, and brilliant Colorado sunshine. I almost felt lucky to get to experience some real snow still this winter. 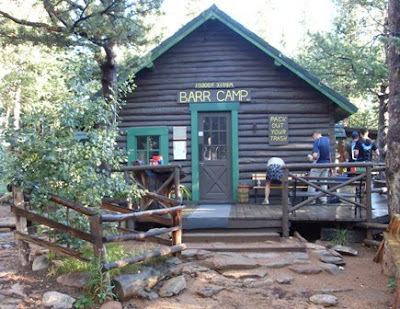 Today was more of the same (but even warmer, with temps in the 50s) in a super-classic run up the Barr Trail to Barr Camp at 10,200' and back. I'll take dealing with a little snow any day to be treated with the alpine views and impossibly bright sun that Colorado has to offer. There was a little more snow up there today than this picture shows!